If you have one or more of these devices below, here are just a few ways to maximize your Genealogy with Technology. Use your smart phone for photo, video and audio. I have made many audio & video recordings of my grandma while asking her questions with my iPhone. The audio was better because my grandma didn't like being video recorded and she was much more relaxed with the audio. Anytime, you're visiting a Genealogical Library, Cemetery or family history site always record & capture your findings. Use your iPad for genealogy research, photos, video, audio and watching home videos of your own family, parents, grandparents, and cousins. The iPad because it's larger and the quality is better than the iPhone for video, audio and photo. Once you have taken your pictures you can upload them to your Blog, Photobucket or Flickr so they are online and safe. If you have taken videos you can easily upload them to your YouTube Channel as another form of backing up your data. 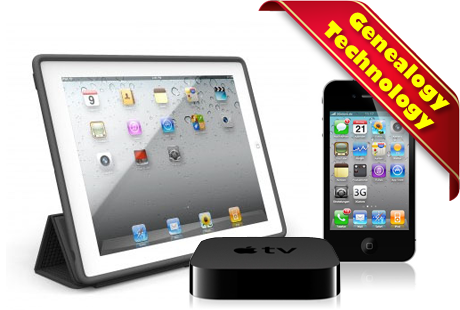 Use your Apple TV to watch videos, audio and photos on your TV that you have just captured. You can also go to your YouTube Channel with the apple TV to watch all your home videos. It's a fun way to spend a family night together. Use your Laptop or PC for genealogical software that builds your family tree, collecting data, researching, and storing all your Genealogical information here. Any family history photos, videos or audio that you capture, place in this folder. Create a Genealogy folder on your desktop to keep everything organized. You can even customize your genealogy folder to have an image of a "family tree", click on the family tree image below for instructions. Genealogy with Technology for the 21st Century.